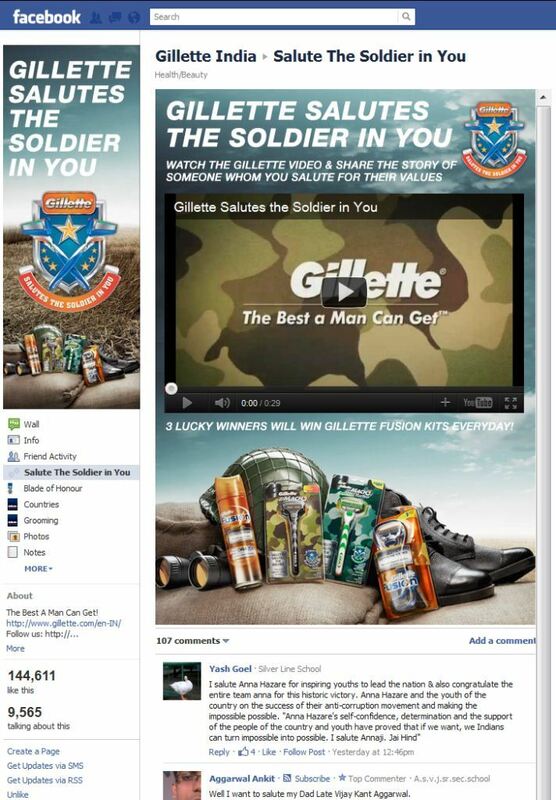 ‘Gillette Salutes the Soldier in You’ seems to be an extension of the Gillette US promo. The US promo is about 'sending love' to the soldiers for the holiday season via messages, photos, videos and Gillette would contribute a dollar to the USO for each Like. In India, the Facebook promo is about sharing the story of someone you salute for their values and everyday 3 winners will win Gillette Fusion Kits. Essentially Gillette has come up with a special soldier range, a percentage of the sales proceeds of which will be contributed towards SWO, an NGO that helps families of deceased, incapacitated and retired soldiers. The overall concept similar to that of the US campaign though the India Facebook promo doesn't quite talk about it, except for a wall post. They have frequent contextual polls and posts to keep the engagement going. There is also an application called the ‘Blade of Honour’ where you can add the eponymous Badge on your profile picture and share. The Facebook Page has about 144k fans and has some content around Gillette Grooming skincare range & Gillette Fusion as well. I am hankering for an exciting, jaw-dropping web experience now. Wishful thinking considering I have at least three more 'On Facebook' posts coming up this week. Why do I feel I already know what the brand pages and applications I am yet to see will have.